The global greenhouse film market depicts the existence of a fairly emerging market that is expected to become consolidated in the near future, says Transparency Market Research on the basis of a recently published report. Such consolidation is mainly expected to be the result of innumerable mergers and acquisitions between key players in this sector. Moreover, the competition is expected to get tougher with the entry of new players on a regular basis in the global greenhouse film market. Berry Global Group, Inc., RPC BPI Group, BASF SE, Barbier Group, Plastika Kritis S.A., and RKW Hyplast NV, are key players operating in the global greenhouse film market. Most players intend to improve the quality of their respective products as a chief strategy to outshine their rivals. Other schemes wherein an extensive focus has been imparted by most companies involve product differentiation, expansion of product portfolio, and increasing geographical reach. Regulating costs of greenhouse films to benefit overall greenhouse construction costs also is a key strategy associated with most businesses present in the global greenhouse film market. 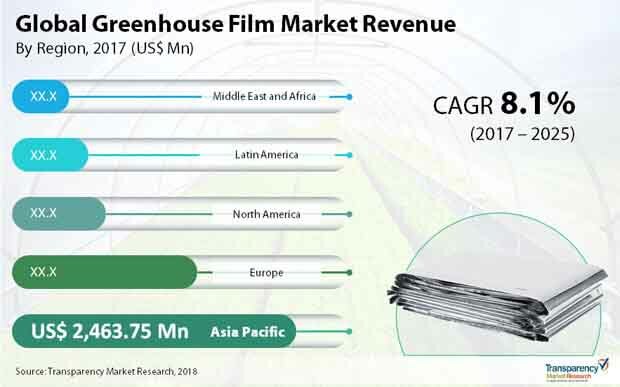 According to experts from Transparency Market Research, the global greenhouse film market is expected to fetch revenue worth US$6,900 mn by the end of 2025. This growth is projected to occur at a splendid CAGR of 8.1% during the forecast period from 2017 to 2025. Increasing greenhouse cultivations owing to the rising need for appropriate environmental conditions such as temperature and humidity is a major factor driving the growth of greenhouse film market. If environmental conditions are maintained properly, a large yield of crops can be acquired. Crops such as tomatoes, lettuce, basil, and cucumbers grow outdoors only during a specific period in the year. These crops command high prices commercially. Greenhouse films used in greenhouse structures help in cultivation of these crops during their off-season, thereby reducing their costs. Apart from cost regulation of crops, widespread advancements occurring in the field of agricultural technologies has also been responsible for making the market grow at a rampant pace in recent times. Moreover, a surge in awareness regarding the use of greenhouses in remote and emerging regions too has contributed towards the market’s excellent phase of expansion. With a great focus imparted on utilizing renewable energy resources and smart agricultural methods, the global greenhouse film market is expected to grow by leaps and bounds during the next few years. However, the global greenhouse film market is highly restrained owing to lack of raw materials required to manufacture required components in underdeveloped and certain developing economies. Due to this reason, procurement of the film components has become largely difficult, thereby discouraging companies from undertaking construction of greenhouses in such regions. Shortage of necessary manpower in these regions too is a key factor hampering the market’s progress. In some economies, very low profit margins exist in the production of greenhouse films owing to less demand. This is mainly due to the required raw materials being highly expensive, and this expense could pass on to the customers in the form of high product costs. However, many businesses are expected to introduce several cost-regulated greenhouse film varieties, thus offsetting most of the restraints affecting the global greenhouse film market. Widespread advancements occurring in the field of agricultural technologies has been responsible for making the market grow at a rampant pace in recent times. With a great focus imparted on utilizing renewable energy resources and smart agricultural methods, the global greenhouse film market is expected to grow by leaps and bounds during the next few years.